Fuguki Suikazan [Edo Tensei] was a member of Seven Ninja Swordsmen of the Mist who wields Samehada. Fugaku Suikazan was killed by Kisame Hoshigaki as Fugaku Suikazan leaking information to enemies. 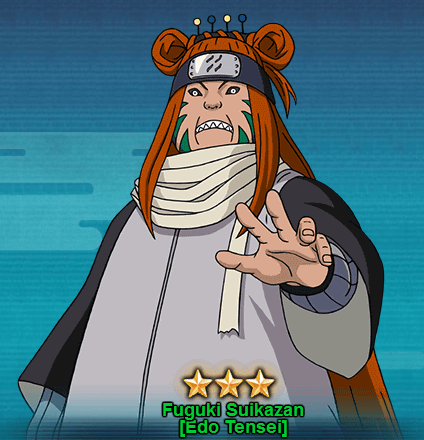 Fuguki Suikazan [Edo Tensei] is not as strong as other Seven Sowrdsmen of Mist ninja characters in Naruto Online game. However, he would be great addition to the team if you’re around level 60’s. Taijutsu & Ninjutsu Ninja Art – Needle Senbon [Prompt]: Causes damage and 8 COMBO to all opponent’s units in their Lineup, the selected unit will also suffer Repulse. Taijutsu Taijutsu Attack: Attacks the opponent’s units in the front row, has a given chance of causing Low Float. Taijutsu Ninja Art – Wild Hair: Chases and Attacks a Low Floated unit, causes High Float and Tag. Can be triggered 2 times. Taijustsu Fearless: This unit will also have its Defense and Ninjutsu increase by 1.2% every time it losses 1% of its Life Points. Taijutsu Battle Lust: Reduce the unit’s Myster Skill’s Cooldown time by 1 every time the unit is attacked. The only way to get Fuguki Suikazan [Edo Tensei] is from the GNW (Great Ninja War) Treasure. You will need to draw only 10 scrolls to get Fuguki Suikazan.